To achieve the best results with our engraving and sublimating processes, high quality artwork is required. For newly submitted artwork, there is a one-time artwork set-up charge which is determined by the type and quality of the artwork provided. For all processes, we strongly prefer vector format artwork, such as .eps (Encapsulated Post Script), .cdr (CorelDRAW) and .ai (Adobe Illustrator) files. Vector artwork is scalable without losing resolution and easily editable. Often times, this is the type of file a logo is created in by the original designer. A note about PDF files: Vector artwork is sometimes saved as a PDF file so it can be shared easily and viewed without specialized graphics software. However, any file can be saved as a PDF file. Just because it’s saved as a PDF file doesn’t guarantee it is acceptable. If you’re not sure, send it to us and we can check if it is compatible with our processes. If vector artwork is not available, all artwork must be provided in a 300 DPI (dots per inch) resolution. Artwork created for use on or saved from the internet is typically 72 DPI or lower and is not suitable for our processes. Photographs or other scanned artwork must be scanned at 300 DPI or more. 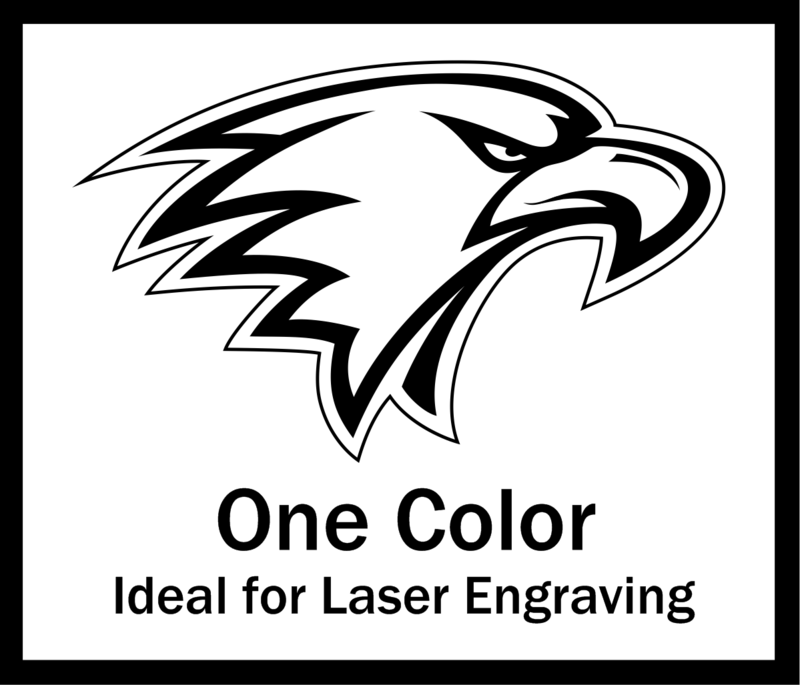 For all laser engraving processes, one color artwork is required. The laser engraving process does not allow for any type of shading, colors, or grayscale. For sublimation processes, full color artwork is allowed and encouraged! Sublimation allows for photo-realism and vibrant colors. If exact color matching is important for your project, a “hard copy” example of the desired color must be provided. This can be a brought in printout or an item for color matching. We cannot guarantee exact PMS color matching. We are a PC based company, so please convert any Apple/Mac files to PC-compatible formats. Artwork can be emailed or brought in on a CD or USB drive. For large files, providing links to uploaded files stored on services like DropBox, SkyDrive, iCloud and the like is encouraged. By placing your order and providing us with files, you are agreeing that you have authorization to use any copyrighted materials provided and authorize us to use those materials for the production of your order. Please save all Adobe Illustrator files in version CS5 or older and all CorelDraw files in X5 or older. For all vector artwork containing static text, please convert all text to curves. For editable text, please provide all font files used. Sending files in unacceptable formats may incur additional artwork charges and/or delay the processing of your order. We reserve the right to reject any artwork that is not suitable for our processes. If you are not sure if your artwork is suitable or how to send it, please contact us and we will be happy to help! Our designers can edit or re-create your artwork if necessary.